» My Dragon has landed in Wales.....Welcome "Draig bach"
» Barkie's English Cottage SFGarden in Wales, Uk. Its not much of a get together then is it?? Awwww thanks for the invite. I didn't like to barge in after my long time absent without leave! Tracy wrote: Awwww thanks for the invite. I didn't like to barge in after my long time absent without leave! That is a shame Tracy I was half expecting you to come with Lesley. Will take photo's and add them on here . We will take lots of photo's. I am just keeping my fingers crossed for the weather as I have seen the forecast for tomorrow and it is not looking good at the moment. But I will look again later. It would be a terrible shame as it has been absolutely gorgeous here today,cool but sunny. And my girls are looking gorgeous and groomed too. No I haven't really she is a poppit, a lovely character. Glad you got home safely Lesley. Mali and Tasha have gone fast asleep but they as we all did had a lovely day. And lovely to meet Houkje and her parents too. Oh no, Isabella didn't disgrace herself again did she??? I regret to say she did mis-behave. Unfortunately in the mass panic we didn't take a photograph of the event. She had to endure the cold water tap at the end of the walk otherwise Lesley would have had a very smelly car all the way back home. All things apart it was a love day , a bit of sun like we are having today would have been a bonus but at least the rain held off until we were on our way home.And we didn't hear another peep out of Mali or Tasha the rest of the day. Thanks for that Lesley. At least we had a reasonable day weather wise. It is really awful here today. Lovely photos. If you think yesterday was bad wait until tomorrow. Apparently we will be having an inch of rain and horrendous weather AGAIN here in South Wales. What on earth has happened to summer??? sujay wrote: Lovely photos. If you think yesterday was bad wait until tomorrow. Apparently we will be having an inch of rain and horrendous weather AGAIN here in South Wales. What on earth has happened to summer??? That is typical Sue I didn't realise it was going to be bad here.I am only an hour up the coast from you and just as typical I am having my hair done tomorrow. Neither did I until I saw a headline on msn this morning. I checked the weather for here and it isn't too bad in the morning, but watch out in the afternoon. Maybe they have got it wrong and it will be lovely and sunny with temperatures of 25 degrees. sujay wrote: Neither did I until I saw a headline on msn this morning. I checked the weather for here and it isn't too bad in the morning, but watch out in the afternoon. Maybe they have got it wrong and it will be lovely and sunny with temperatures of 25 degrees. We live in hope Sue. They said it was going to be 19deg on Saturday what did we get 10 deg. And I thought it would be nice for OH Birthday as I was taking him out for lunch. We went to Porthgain Pembs it was very nice all the same and it was somewhere we could walk the girls too, so they enjoyed it. Sadly did not allow dogs in the pub. Now it did take some time, I must admit. My garden had decided to turn into a complete wilderness I had to sort and there were some other things but finally some time to tell you about my stay in Wales. I must say it was lovely and made it very special to be able to meet you all. Thank you very much for the warm welcome, it made my stay so very special!!!! And we had a lovely coffee afterwards! On Friday we went to St. Fagan's and Lesley joined us! 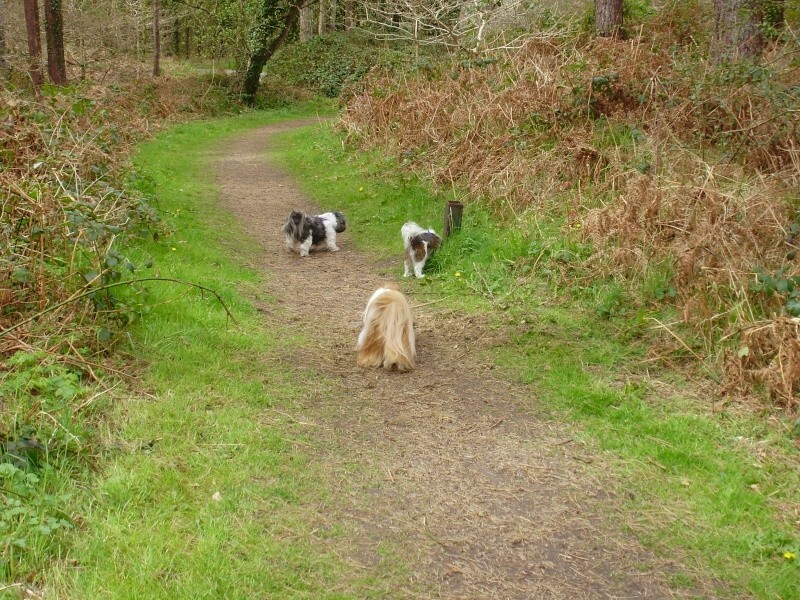 And on the Monday after we went to Bettws-y-Coed and met Annita and Steve!